When I came home the other day, there were two messages on the answering machine for me. The tone sounded urgent, and the second even more so than the first. My husband thought that it must mean dire news. Since the message was addressed solely to me, I doubted it would be serious. It was a request for me to knit a baby blanket. I can handle knitting a baby blanket. I have seen several patterns I would like to knit. However, she had already purchased a kit. The finished dimensions are listed at thirty-one inches square, so it should not take too long. The pattern directs you to knit four squares, sew them together, then pick up and knit stitches to work the border in the round. Yep, that is what I am telling myself as I knit this. I am not overly fond of deadline knitting, and I feel a bit of anxiety when people ask me to knit for them. That being said, this is for a very kind woman. She has another grandchild due later this year. I knit a blanket for one of her great-granddaughters a couple of years ago. I figure that if she asks me to do this every few years, I can continue to say yes. Besides, I like to be nice, and this is purple. Also, I have almost finished the first of the four squares for the center. I would show you my progress, but I cannot locate my camera cable. I made it! The Tour de Fleece is over, and it was the best way to spend my July. If I were a kid in school who had to stand up and speak about What I Did on My Summer Vacation, I would wax idiotic about this. I never even imagined how much fun I would have spinning and carrying on with Team CrankyPants. At the close of the Tour, someone nominated my spinning for an award. I still get choked up thinking about it. I did manage to produce a little yarn. I need to recheck the yardage because I completely spaced each time I went to skein, and lost count. I also think the alpaca/silk could benefit from a little more spa time. Anywho, without further ado, this was my spinning experience. I finally opened my July psc bag last week. 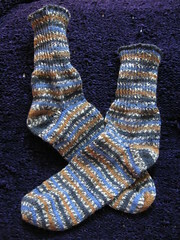 It contained navy blue Louet Gems along with the pattern suggestion of Chalet Socks from Folk Socks by Nancy Bush. I have printed the pattern (needed to enlarge charts) and the yarn is ready. The ribbing is finished on the first sock. It does not feel like I have done much of anything, but that is not where I am keeping my focus. I have accomplished things this month. I finished the May and June psc pairs. I made a short pair of socks for me. 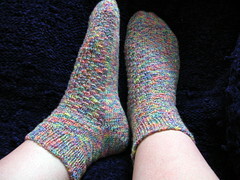 This is the Show-off Stranded Socks pattern. I knit them toe-up with short-row heels. The yarn is Regia Bamboo. I love the bright colors, the socks feel great, and I can wear them almost any time of the year. Brucie's new socks are plain vanilla toe-ups. The yarn is Lion Brand Magic Stripes. Yes, socks look better when modeled, but I did not want to wait any longer, and it would be wrong of me to wake him or try for a photo shoot while he sleeps. Time to get back to spinning! 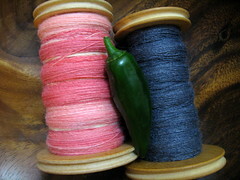 I cannot believe how much time I have spent spinning, yet have not used too much fiber. Let me explain. If my calculations are correct, during the first eight days, I spun a whopping six ounces on my wheels. I spun on the wheels all but one day, and that day I spun a small amount on the spindle. Yes, I am still on the first two ounces of anniversary fiber. Lest you think this is complaining, let me assure you that it is not. It actually makes me quite hopeful for the yardage. I must be in the process of creating skeins of yarn that will knit forever, right? My nightly ritual has been to stop spinning a little after 11pm, take pictures, upload to flickr, and post to the sharing thread in the Tour de Fleece group on Ravelry. They are not very good photos. To say that they bear a strong resemblance to each other is an understatement. I take about three each day--one of the alpaca/tussah on Kiwi, one of the Shetland on Traveler, and one of the two together. While I know the daily progress shots are not likely to win any prizes, (there are two each day) I still like posting them. 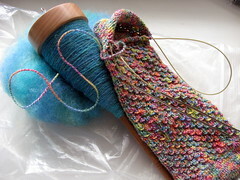 I think it is great that so many people are showing what they have spun. 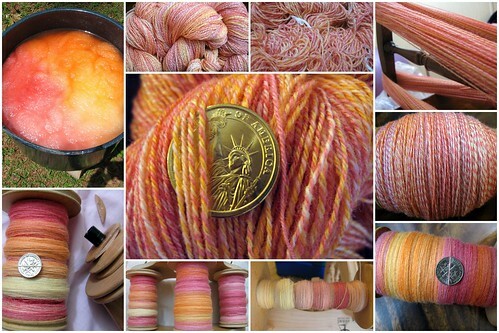 There is a wide variety of styles, colors, skills, fibers, wheels, and spindles. I am always excited when the voting opens. I usually grab a drink and relax while I just take in the images and inspiration. I love that I can cast a vote for more than one favorite of the day. I feel like I am learning so much. Speaking of learning, let's talk spinning books. People really seem to like the new book, Spin Control: Techniques for Spinning the Yarns You Want by Amy King. I would like to learn more about spinning, and am thinking about books or dvds. I might like to take a class one day, but the opportunity for that is not currently available. Anyway, I am looking for book and dvd recommendations. If you have suggestions, could you tell me what it is about that resource you believe is helpful? I am seeking this information out for another reason, too. My grandmother just bought her first spinning wheel, and she is seeking books to expand her knowledge and skills, too. For her, it has to be books, as she does not have a dvd (or vhs, for that matter) player, and for some reason (*cough*Grandpa*cough*) seems resistant to the idea of one. She will be visiting at the end of the month, and I would like to have something for her. I already have some fiber, but may not be able to wait. I just might need to mail it to her this week. We were only away from home for about fifty hours, but it felt like much longer. Brucie probably has some type of influenza that earned him a brief, unexpected hospital admission. They tested him for so many things, but were never able to pinpoint the exact cause. That meant we were stuck in a little isolation room. Not exactly my favorite place to be, but it was where he needed to be, and they took excellent care of him. There were a few cranky-making moments, but we really are just glad to be home, and I am relieved to see that he looks like he is getting better. While not having a few key items made being away from home a bit uncomfortable, I had knitting. I was also able to keep with the Tour de Fleece, as the bag I grabbed on our way out the door had a drop spindle and fiber, too. I was briefly stuck on one knitting project when I reached the end of a ball of yarn, and the other was out in the car in the parking deck. That gave me the excuse to take a walk the next morning to retrieve it. Anyway, I am taking a slow re-entry, and there is certainly plenty to do, but I will just take it one step at a time. I had hoped for quite some time to have a spinning wheel, but did not know when or if it would happen. Then, Kiwi came to me nearly two years ago. In her former home, she created beautiful yarn, but the time she took away from knitting became too great, and she had to leave. It is true that Kiwi loves to spend as much time as possible in the creation of new yarn. However, she realizes that the yarn we make together sometimes has a purpose beyond just being yarn, and is accommodating when it comes to knitting time. Sometimes she cries when she feels that too much time has passed since we last spun together. The fiber stash then gets in on the act, along with the spindles. She does not quite understand those spindles, and wishes they would stay out of the nice fiber. Still, we have made a happy home together, and seem to find a nice balance most of the time. What Kiwi did not know until recently, is that I have harbored a small hope to become a multi-wheel home. Recently, I began exploring this possibility beyond flipping through catalogs. Kiwi could not stand the searches of classified ads and auction listings. I assured her that barring some ridiculously fantastic deal, she was not in any danger of having to share me with another wheel, but she was not convinced. She settled down when we joined a group for our kind on Ravelry, and added our names to the list to participate in The Great Kiwi Migration. She even stopped whining about the extra time I have been spending with Little Si, the drop spindle. Imagine the surprise of us all when we received word of a single drive, double treadle, Ashford Traveler with six bobbins in need of a new home. It was all so sudden, and the next thing you know, I am bringing another wheel into our home. I had read all of the pertinent articles on introducing wheels to each other. I started by letting Kiwi see the six bobbins. At first, she thought they were for her, as the Kiwi and the SD Traveler use the same bobbins. Then she heard the unmistakable sound of treadling coming from the next room. At first, she was upset and cried, but then she heard the squeaking, and became concerned. While the new wheel was well cared for in her previous home, it was obvious that she had not been attended to recently. A few well placed drops of oil later, and she was happy as can be. I spent a bit more time spinning and getting to know the new wheel, and then placed it next to Kiwi in the next room. I figured they could use some time to get to know each other, and I had laundry to fold. I stopped outside their room to hear how they were getting along. The new wheel was breaking the ice with a gift. New Wheel: Have you ever tried Bee Mice Elf Fiber? No? Well, here is a little bit for you to try. Kiwi: Thank you so much. That is such a cute little package, and I love the colors. New Wheel: You're welcome. I love trying out new fibers. Kiwi: Me, too! Oh, I see which wool you have been subjected to today--the dreaded practice fiber. New Wheel: (sighs in relief) I am glad to hear this is just the practice stuff. I am not a fan of it. Kiwi: No one is. She doesn't even like it, but drags it out on occasion when she is experimenting. New Wheel: What size bobbins do you use? We look like we might be about the same size. Kiwi: We totally are! I was checking out the bag of bobbins you brought with you. New Wheel: We should totally switch bobbins with each other. Kiwi: That would be awesome! Oh! You're going to do Tour de Fleece with us, right? New Wheel: I sure hope so. I've never participated before. Kiwi: Neither have we, but she seems quite excited about it. We've already joined a team. It's something to do with a garment of irritability or some such nonsense. I do not even pretend to understand her. She's crazy. I took that as my cue to walk away before my feelings were seriously hurt. 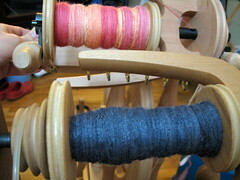 I think they will get along well, and I am excited about the new adventures in spinning just waiting for me. 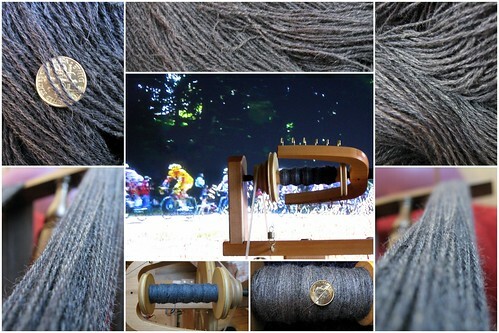 I am continually posing that question to other knitters who have expressed even the tiniest interest in spinning. The tamest responses have been, "No." Most have even laughed and humored me as I attempted to mock-pressure them into joining. I understand that the event is not for everyone. I am even trying to extend that understanding to the one who offended me on the topic of spinning. Perhaps I do not yet get her. It would appear that she does not get me. I know that not everyone likes me, and some of my attempts at humor fail. However, when I cannot quite find my way to getting over the irritation, I am glad for my Tour de Fleece team. Thanks to Cookie, I am a member of Team CrankyPants. I think I have read more in that thread than I have in the rest of my time on Ravelry. Lately, it has been overflowing with enabling attempts in link and picture form. With all of the lovely fiber, it is hard to stay in a foul mood. Still, it is nice to have a place where crankiness is accepted, and even jokingly celebrated. I am still contemplating goals for the Tour. The piles of fluff I recently dyed seem like good candidates, and sixteen ounces would be a challenge. I want to keep the pressure low, so maybe one of those and then the smaller bump of alpaca/silk that has been in stash form for quite some time. I still have a day or so to decide, right?